Recording songs/audio files for offline enjoyment is common nowadays. Thanks to the development of recording technologies, the audio quality of the recorded files have improved dramatically. But many people still wonder how to record a song for their computer and mobile devices, and save the music files in the compatible file types. There are large number of apps and software available that enables the user to record a song, and many of them claim that they can provide high recording quality. If you feel confused about these song recording programs, this post is just right for you. This post will introduce how to record a song with the recording programs and recording website. Check it out if you are interested. iMusic is one of the best recording programs that features downloading as well as recording option, so that you are able to get your favorite tracks without any effort. 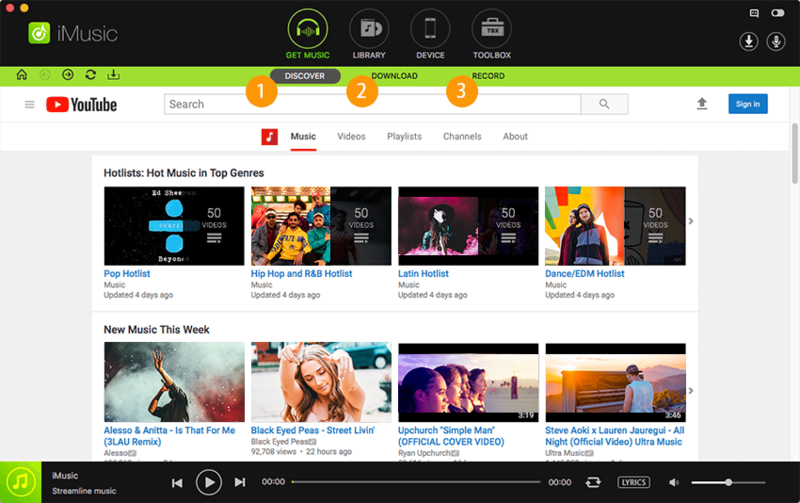 The software supports all the major websites like YouTube, Soundcloud, Vimeo, Vevo and many others. Below given is the list of features that comes along with the software. iMusic offers the music library that saves your downloaded and recorded music files. The program helps users to get access to their recorded and downloaded files easily. It provides a feature of correcting music tags. The program also allows users to manually edit the music tags. 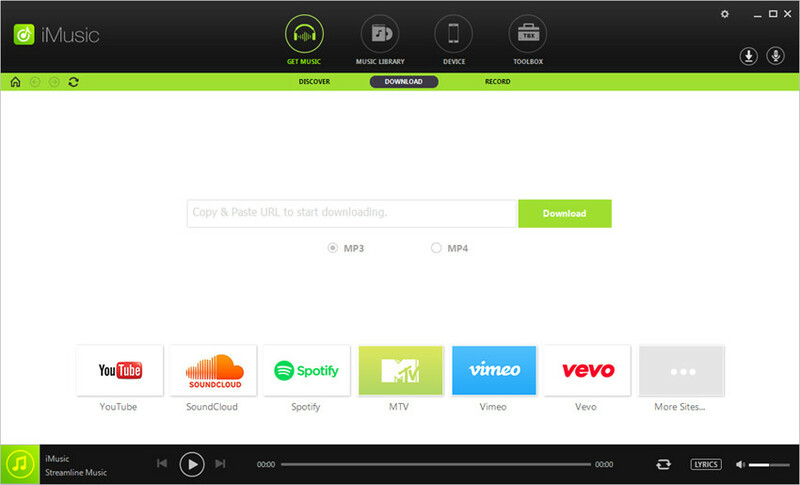 The program saves the recorded music files in MP3 audio files, which is supported by almost all computers and mobile devices. If you have iTunes on your computer, you can use this program to manage your iTunes Music Library. The software enabels users to transfer downloaded or recorded files to mobile devices with one click. Step 1. Start iMusic on your computer after the installation. 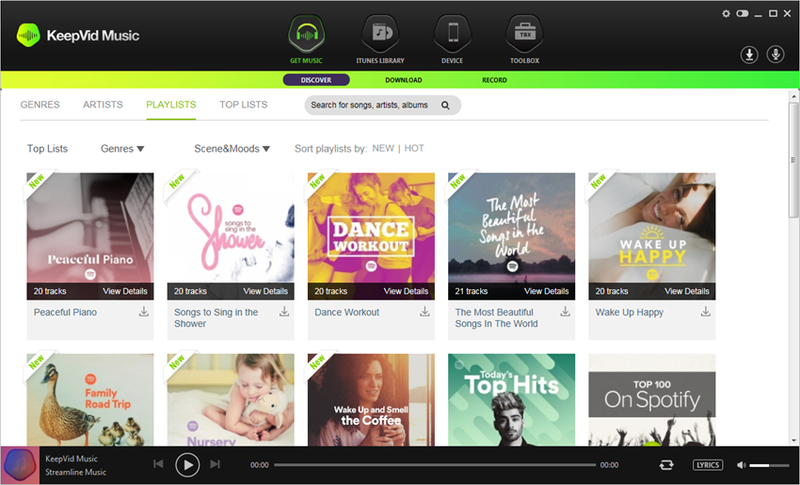 Then you'll see the main interface of discovering music. Step 2. Choose the RECORD option at the top middle of the software window, and then click the Record button at bottom to let the program stand by. Now you can play the music file you need, and the program will automatically record it. Note: Please note that iMusic can get the complete music info only if you click the Record button before playing the music. Step 3. You can click the Record button again to stop recording. When the recording process finishes, you can click the microphone icon at the upper right corner of the window to view the recorded music files. Wondershare Streaming Audio Recorder is another option for you to record a song on computer. This program is a simplified audio recording program for desktop users, and it will save the recorded audio files in MP3 files. This part will introduce the key features of this program and how to use it to record a song. 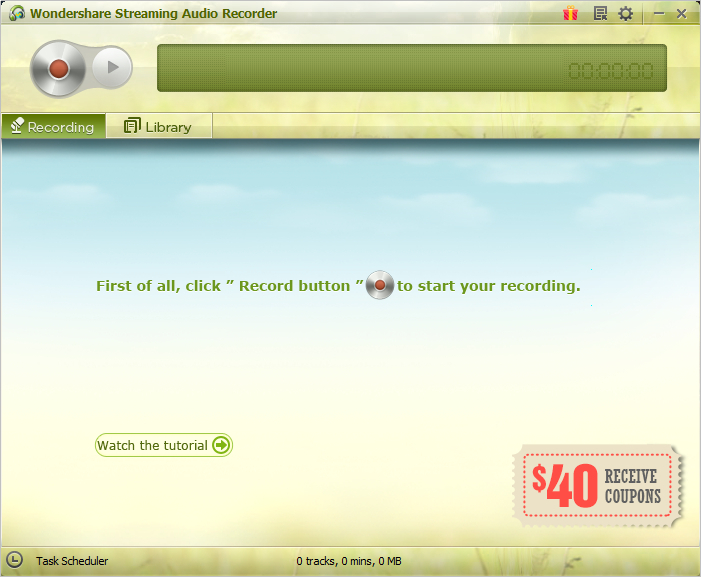 Wondershare Streaming Audio Recorder records songs from more than 1000 online resources. The program will save the recorded files in its music library so that the users can get access to them easily. The program offers a Advertisement Removal feature, which allows users to block pop-up ads during the recording process. The audio files can be automatically recorded when the program is running. Wondershare Streaming Audio Recorder allows recording from Internet radio stations such as iHeartRadio, BBC Audio Radio, 8Tracks, AOL Radio, etc. 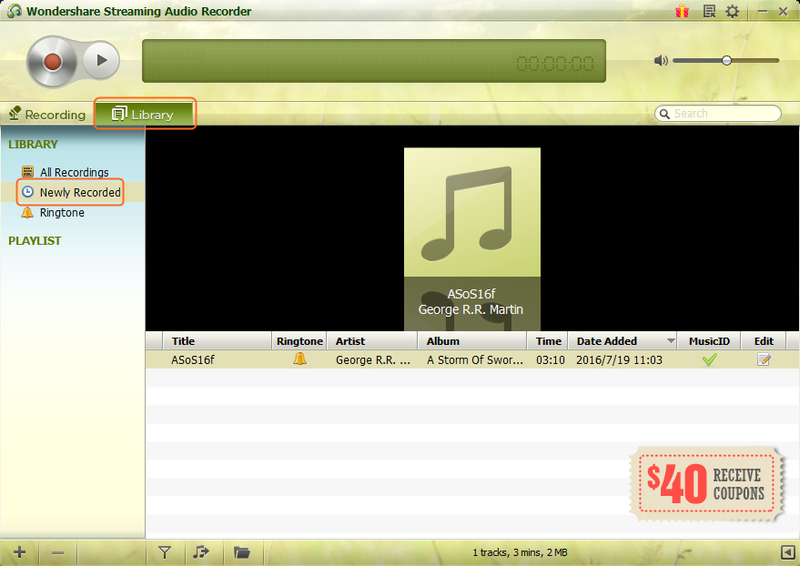 Wondershare Streaming Audio Recorder offers the function for the users to manually edit the ID3 tags. This program permits music enthusiasts to record from commonly used online music resources like YouTube, Spotify, Pandora, etc. The program provides a CD burning feature which allows users to burn music files to personal CDs. Step 1. 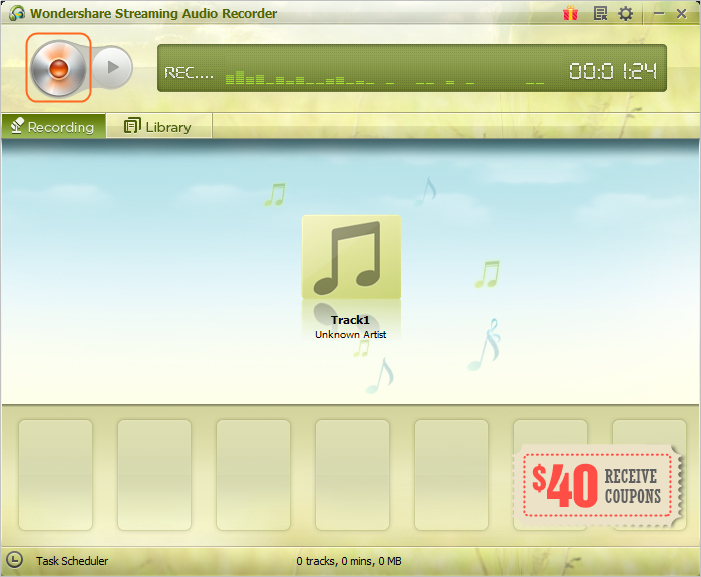 After starting Wondershare Streaming Audio Recorder, you'll see the main interface of this program. The Record button is in the upper left corner of the program. Step 2. Click the Record button to let the program stand by. Then you can play the music file you want, and the program will record music file automatically. Note: Please note that the program records any sound playing via your sound card, so you should turn off any other sound during the recording process. Step 3. Click the Record button again to stop the recording process. 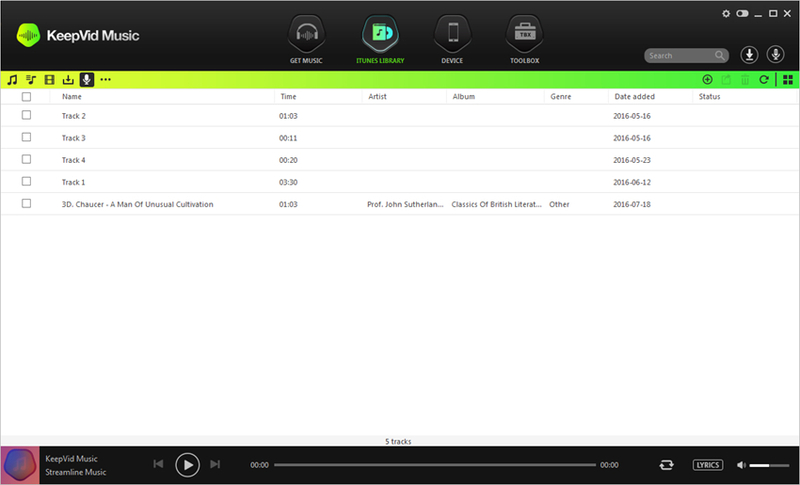 When the recording process finishes, you can choose Library in the main interface, and click the Newly Recorded playlist in the left sidebar to view the recorded songs. Besides the offline method to record a song, you may also want to learn the online audio recorder to record audio files. Online audio recorders, most of them are websites, will provide an easy process for the recording. This part will introduce one of the best online audio recorder to help users to record a song playing on your computer. OnlineVoiceRecorder.com is a great option when you want to record a song on your computer. This online recorder makes the whole recording process easy to be done. The online recorder is very easy to use, and it will allow you to save the recorded files to your local hard drive without entering your email address. The following guide will show you how to record a song with this online audio recorder. Step 1. Go to the wensite, and you'll see several options at the top menu bar. Choose Voice Recorder and the program will show you the recording window. Step 2. Click the Record button at the upper left corner to let the recorder start working. Then play the music file you need, and the program will automatically record the song. If this is your first time to use OnlineVoiceRecorder.com, the site will ask for permission to use the microphone on your computer. Step 3. 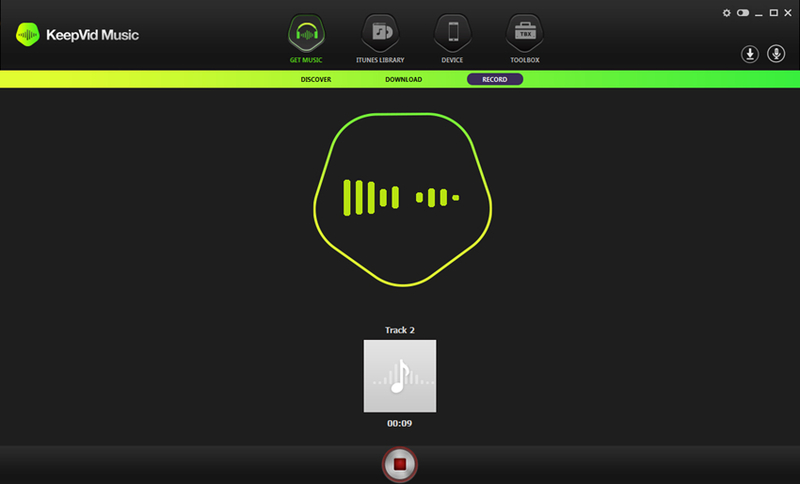 When the recording process finishes, you can click the Record button to stop the recording process. When the recording process finishes, you can click the Save button at the right side of the window, and choose a target folder on your computer to save the recorded music. Conclusion: iMusic, Wondershare Streaming Audio Recorder, and OnlineVoiceRecorder.com will all be helpful for you to record a song on your computer. When making a comparison among these 3 programs, you can easily find out that iMusic provides more powerful features than the other two programs. If you are interested in this program, just free download it to have a try.